The nose has bacon bits, driftwood and peat smoke. The mouthfeel is thin with no cling. 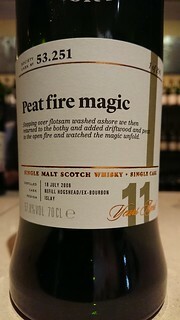 The body has smoked bacon, peat smoke and bonfire ash, with vanilla and a hint of toffee. The finish is peat smoke and ash. Water brings out thin, rapidly expanding mottling that dissipates into brief mottling. The nose gains vanilla. The body gains a hint of lemon. The finish is unchanged. Not the most complex whisky, but very satisfying - several of these would end an evening quite nicely!